New zodiac sign sends horoscope astrology community into a frenzy! The New Zodiac sign, Ophiuchus, not to mention the new sign designations are throwing the horoscope world into a firestorm of debate. It's quite understandable though. I mean, I used to be a Libra, and that made sense but now I'm a Virgo? No Way! I liked being a Libra. Still, according to the new zodiac calendar being reported, Pisces are now Aquarius, Cancers are now Gemini...up is down, dogs making friends with cats, ITS MASS HYSTERIA! Well, it's certainly hysterical and so is this new zodiac shirt. Zodiac 2.0 Now with Ophiuchus! It's a beautiful shirt with loads of humor and fun. We have new zodiac tops for men women and children. 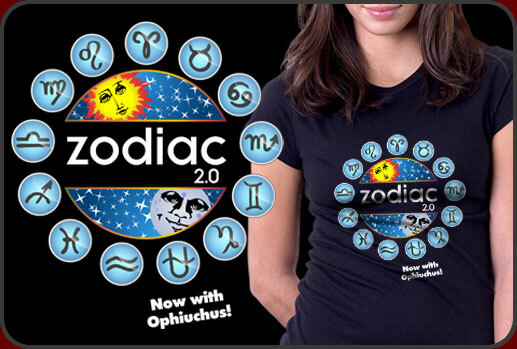 Get your new zodiac shirts today!